WWI flying training accident. 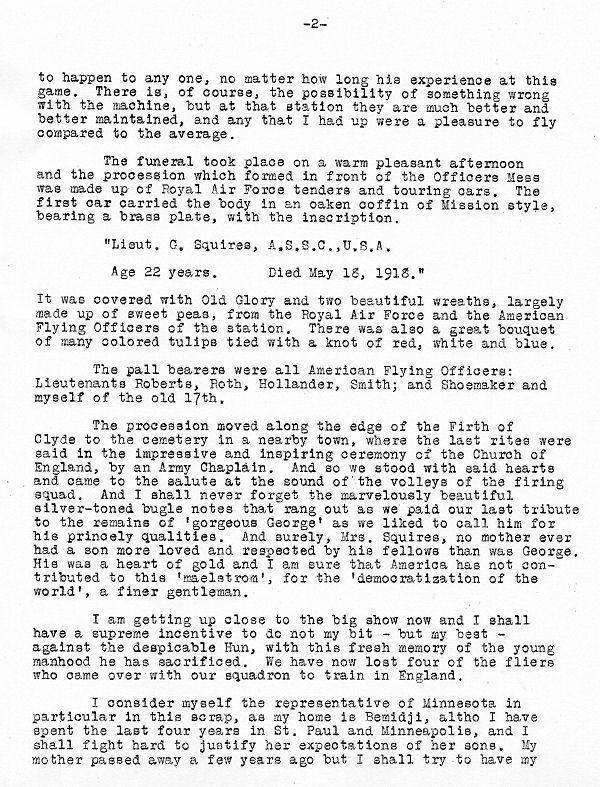 The tragic accident and death of Lt. George Squires as told to his mother in the form of three letters. 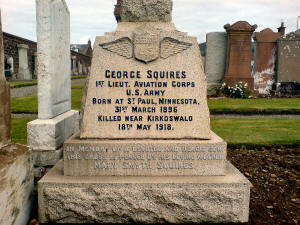 The first two colour photos of the memorial to Lt. George Squires were taken at Doune Cemetery, Girvan. Contributed by David Hastings. The letters and two photos on the right below were contributed by Sidney Clark. Click on the images below to view them full size. It is with the very deepest regret and sympathy that I have to confirm the news, which you have no doubt received by telegraph, of the death of your son, 1st Liet. 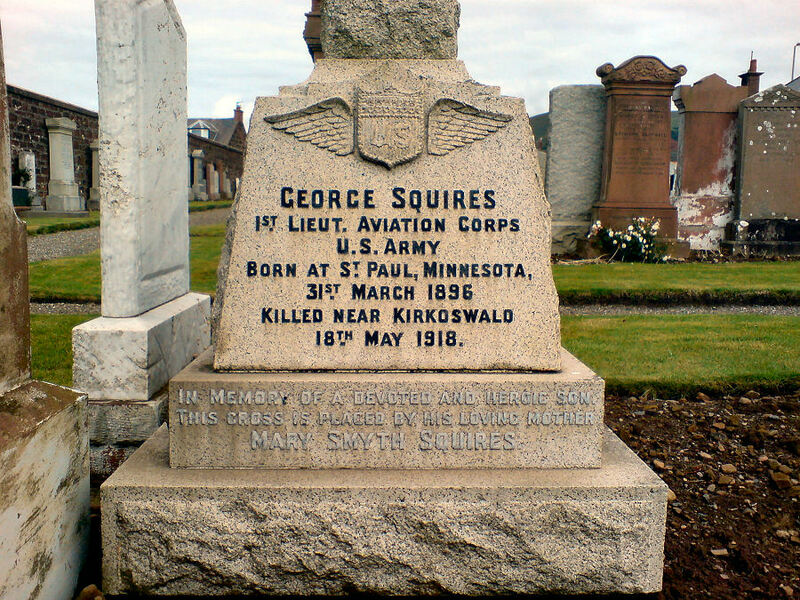 George Squires, who was at the time attached to this School for a Course of Instruction in Aerial Fighting and Gunnery. I beg to give you the following brief particulars of the fatal accident and of the funeral arrangements. 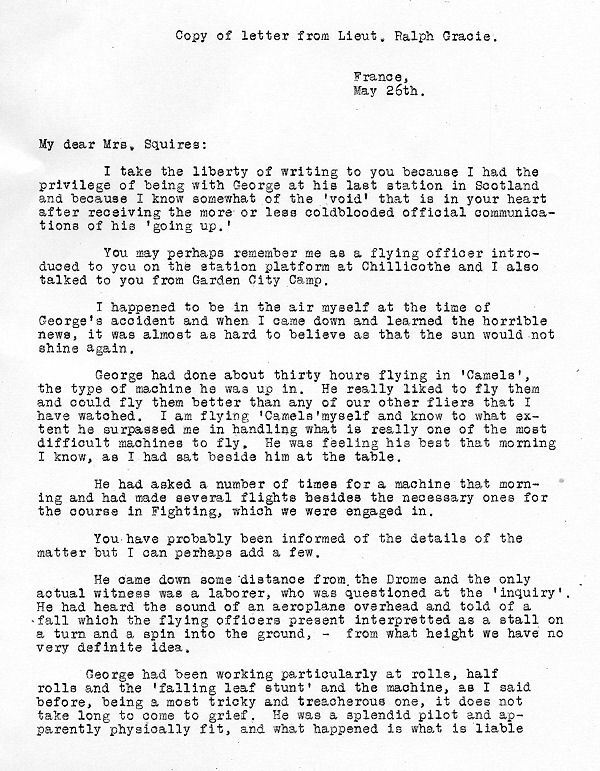 On Saturday May 18th, at 10:30 in the morning the machine of 1/Lt.G.Squires, who was carrying out practice in certain fighting evolutions, was seen to circle slowly and begin descending, the descent taking place apparently normally until the machine dived at a steep angle and crashed to the ground. Your son was in sole control of the machine, no passenger being carried on the type he was flying. A Court of Inquiry investigated the circumstances on the following day, and it was not established from all the available evidence what was the definite cause of the accident. There was no structural defect suspected in the machine, as the latter had been reported in perfect condition and "OK." for flying on its descent from a flight undertaken by one of the instructors immediately before the fatal one. 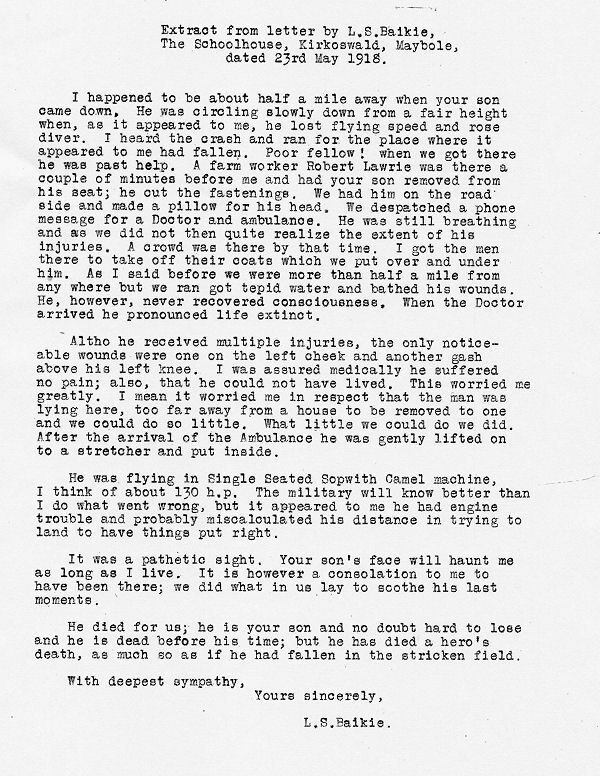 In view of the evidence given by a farm hand who witnessed the accident, it is considered almost certain that your son was endeavoring to make a forced landing owing to engine failure, and that he lost flying speed, (i.e., the speed sufficient to maintain a machine in the air) at a height which did not permit him to recover from the ensuing dive. The fall took place about 1000 yards south of Kirkoswald Village, Ayrshire, at a point almost exactly two miles eastward of and inland from this aerodrome. Immediately upon the report of the accident happening, the motor ambulance with Medical Officer proceeded to the scene, and found 1/Lt. Squires dead, having been extricated from the wreckage by a local resident who was first on the spot. The cause of death was fracture of the base of the skull, both thighs had been fractured and there were other injuries, and it is considered that death was practically instantaneous upon the machine striking the ground. 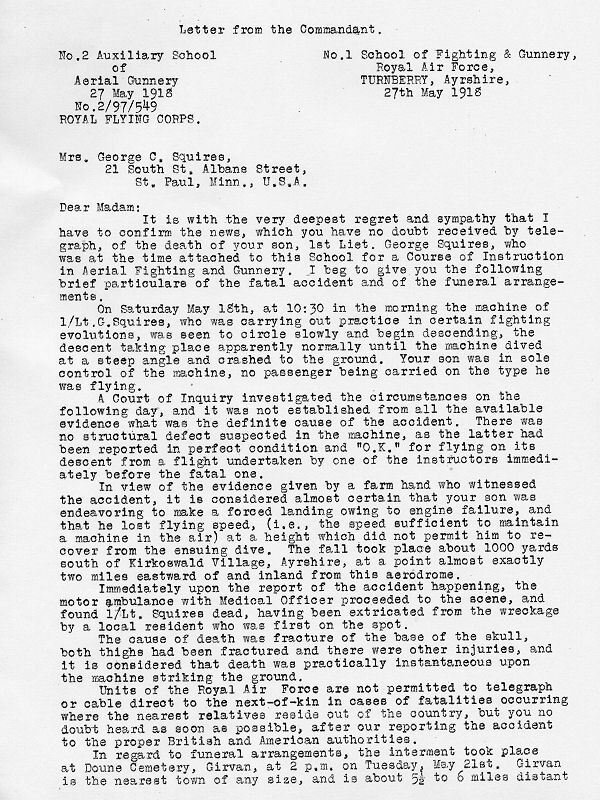 Units of the Royal Air Force are not permitted to telegraph or cable direct to the next-of-kin in cases of fatalities occurring where the nearest relatives reside out of the country, but you no doubt heard as soon as possible, after our reporting the accident to the proper British and American authorities. 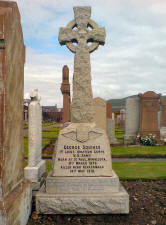 In regard to funeral arrangements, the interment took place at Doune Cemetery, Girvan, at 2 p.m. on Tuesday, My 21st. Girvan is the nearest town of any size, and is about 5 to 6 miles distant from this Station. 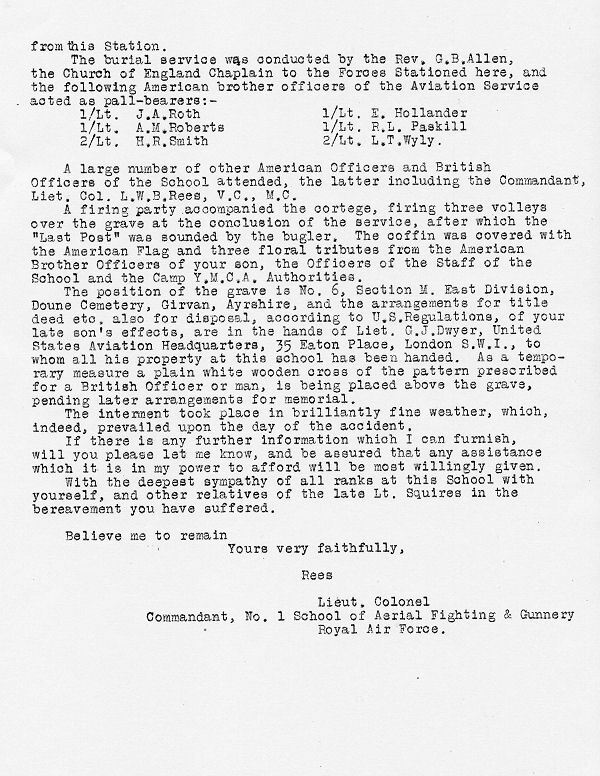 A large number of other American Officers and British Officers of the School attended, the latter including the Commandant, Liet Col. 1,.W.B.Rees, V,C., M.O. 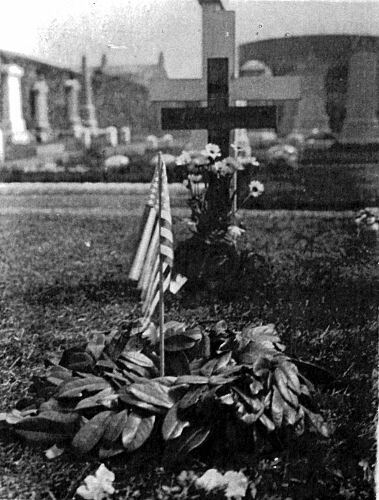 A firing party accompanied the cortege, firing three volleys over the grave at the conclusion of the service, after which the "Last Post" was sounded by the bugler, The coffin was covered with the American Flag and three floral tributes from the American Brother Officers of your son, the Officers of the Staff of the School and the Camp Y.M.C.A. Authorities. The position of the grave is No. 6, Section M. Fast Division, Doune Cemetery, Girvan, Ayrshire, and the arrangements for title deed etc, also for disposal, according to U.S. Regulations, of your late son's effects, are in the hands of Liet. G.J.Dwyer, United States Aviation. Headquarters, 35 Eaton Place, London S.W., to whom all his property at this school has been handed. As a temporary measure a plain white wooden cross of the pattern prescribed for a British Officer or man, is being placed above the grave, pending later arrangements for memorial. If there is any further information which I can furnish, will you please let me know, and be assured that any assistance which it is, in my power to afford will be most willingly given. With the deepest sympathy of all ranks at this School with yourself, and other relatives of the late Lt. Squires in the bereavement you have suffered. 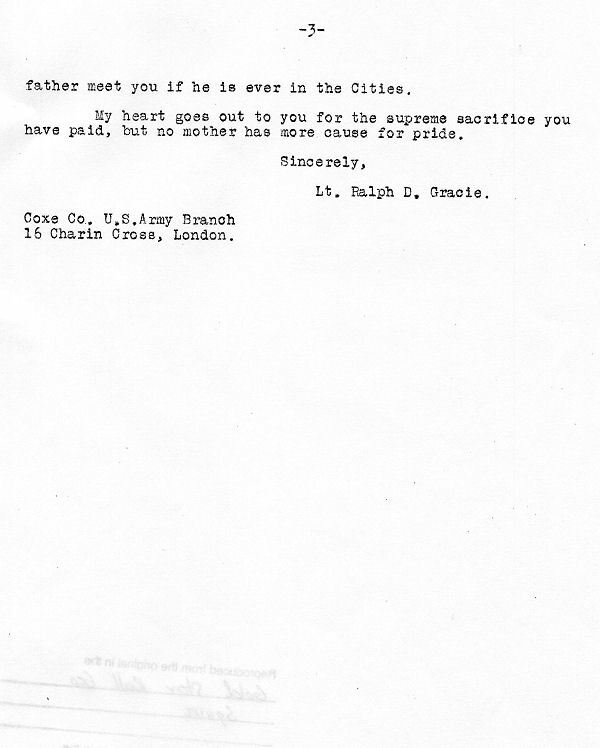 Letter from Lieut. Ralph Gracie. You may perhaps remember me as a flying officer introduced to you on the station platform at Chillicothe and I also talked to you from Garden City Camp. I happened to be in the air myself at the time of George's accident and when I came down and learned the horrible news, it was almost as hard to believe as that the sun would not shine again. George had done about thirty hours flying in 'Camels', the type of machine he was up in. He really liked to fly them and could fly them better than any of our other fliers that have watched. I am flying 'Camels' myself and know to what extent he surpassed me in handling what is really one of the most difficult machines to fly. He was feeling his best that morning I know, as I had sat beside him at the table. He had asked a number of times for a machine that morning and had made several flights besides the necessary ones for the course in fighting, which we were engaged in. You have probably been informed of the details of the matter but I can perhaps add a few. He came down some distance from, the Drome and the only actual witness was a laborer, who was questioned at the 'inquiry'. He had heard the sound of an aeroplane overhead and told of a sound which the flying officers present interpreted as a stall on a turn and a spin into the ground, from what height we have no very definite idea. George had been working particularly at rolls, half rolls and the 'falling leaf stunt' and the machine, as I said before, being a most tricky and treacherous one, it does not take long to come to grief. He was a splendid pilot and apparently physically fit, and what happened is what is liable to happen to any one, no matter how long his experience at this game. There is, of course, the possibility of something wrong with the machine, but at that station they are much better and better maintained, and any that I had up were a pleasure to fly compared to the average. The funeral took place on a warm pleasant afternoon and the procession which formed in front of the Officers Mess was made up of Royal Air Force tenders and touring cars. The first car carried the body in an oaken coffin of Mission style, bearing a brass plate, with the inscription. "Lieut. G. Squires, A.S.S.C., USA. Age 22 years, Died May 18, 1918." It was covered with Old Glory and two beautiful wreaths, largely made up of sweet peas, from the Royal Air Force and the American Flying Officers of the station. There was also a great bouquet of many colored tulips tied with a knot of red, white and blue. The pall bearers were all American Flying Officers: Lieutenants Roberts, Roth, Hollander, Smith, and Shoemaker and myself of the old 17th. The procession moved along the edge of the Firth of Clyde to the cemetery in a nearby town, where the last rites were said in the impressive and inspiring ceremony of the Church of England, by an Army Chaplain. And so we stood with said hearts and came to the salute at the sound of the volleys of the firing squad. And I shall never forget the marvelously beautiful silver-toned bugle notes that rang out as we paid our last tribute to the remains of 'gorgeous George' as we liked to call him for his princely qualities. And surely, Mrs. Squires, no mother ever had a son more loved and respected by his fellows than was George. His was a heart of gold and I am sure that America has not contributed to this maelstrom, for the 'democratization of the world', a finer gentleman. I am getting up close to the big show now and I shall have a supreme incentive to do not my bit - but my best -against the despicable Hun, with this fresh memory of the young manhood he has sacrificed. We have now lost four of the fliers who came over with our squadron to train in England. I consider myself the representative of Minnesota in particular in this scrap, as my home is Bemidji, although I have spent the last four years in. St. Paul and Minneapolis, and I shall fight hard to justify her expectations of her sons. My mother passed away a few years ago but I shall try to have my father meet you if he is ever in the Cities. My heart goes out to you for the supreme sacrifice you have paid, but no mother has more cause for pride. I happened to be about half a mile away when your eon came down, He was circling slowly down from a fair height when, as it appeared to me, he lost flying speed and rose diver. I heard the crash and ran for the place where it appeared to me had fallen. Poor fellow! when we got there he was past help. A farm worker Robert Lawrie was there a couple of minutes before me and had your son removed from his seat; he cut the fastenings. We had him on the road side and made a pillow for his head. We despatched a phone message for a Doctor and ambulance. He was still breathing and as we did not then quite realize the extent of his injuries. A crowd was there by that time. I got the men there to take off their coats which we put over and under him. As I said before we were more than half a mile from any where but we ran got tepid water and bathed his wounds. He, however, never recovered consciousness. When the Doctor arrived he pronounced life extinct. Altho he received multiple injuries, the only noticeable wounds were one on the left cheek and another gash above his left knee. I was assured medically he suffered no pain; also, that he could not have lived. This worried me greatly. I mean it worried me in respect that the man was lying here, too far away from a house to be removed to one and we could do so little. What little we could do we did. After the arrival of the Ambulance he was gently lifted on to a stretcher and put inside. 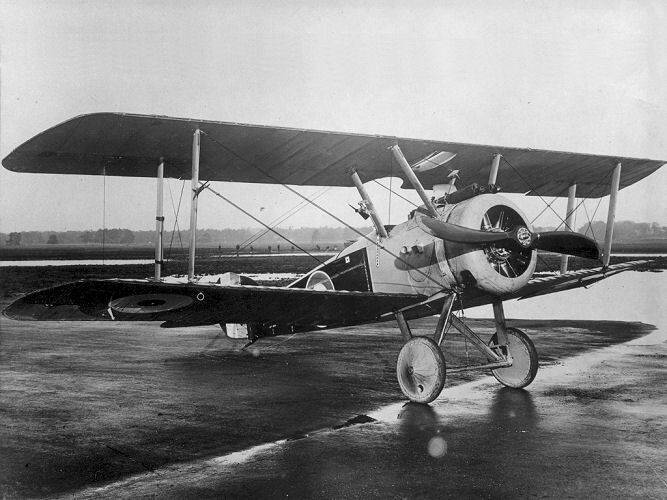 He was flying in Single Seated Sopwith Camel machine, I think of about 130 h.p. The military will know better than I do what went wrong, but it appeared to me he had engine trouble and probably miscalculated his distance in trying to land to have things put right. It was a pathetic sight. Your son's face will haunt me as long as I live. It is however a consolation to me to have been there; we did what in us lay to soothe his last moments. He died for us; he is your son and no doubt hard to lose and he is dead before his time; but he has died a hero's death, as much so as if he had fallen in the stricken field.